As the CEO of a global concierge company, my life is often a whir of long flights with remarkably short terrestrial adventures before I am in the air again. 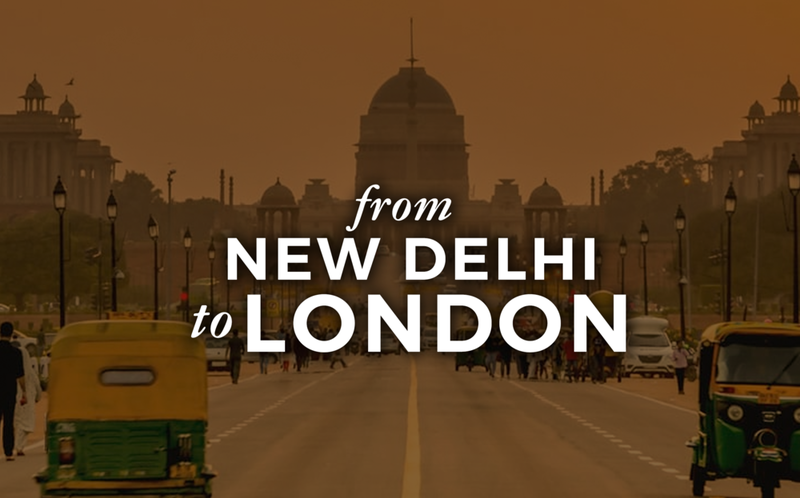 A recent expedition to review a new property in India took me to New Delhi for an overnight stay. Immigration in New Delhi is as chaotic as the streets outside. Even at 4:30am it’s important to watch the lanes for immigration to ensure that you don’t get caught in a slow-moving line, which can make a 30-minute wait seem like hours. My hotel of choice for this overnight stay was The Manor Hotel (www.themanordelhi.com) a small boutique hotel with a spa and a lauded Kashmiri restaurant Kola Hoi. I finally rested my head on a pillow at 6am and woke several hours later in time for lunch at Kola Hoi. I sampled numerous healthy dishes and was pleased with each one. I recommend sitting in the garden to really enjoy your meal at a leisurely pace but it needs to be cleared with restaurant since apparently it was an issue to be able to move outside. The spa at The Manor is worth trying. I sampled a couple of treatments and wish I could have stayed for more. Sadly, I needed to leave the hotel after my brief stay for an evening flight to London. No rest for the wicked, as they say. London is one of my favorite cities in the world. It has almost everything you could want, except of course, sunshine. That aside, London is a wonderful city to explore the best the world has to offer. It’s even more wonderful when you share it, so I decided to invite my favorite people in the world…my family. Upon arrival in London, I was met by my wife, my son and daughter, my brother and my father. This trip was already shaping up to be one to remember. For this family trip, we decided to stay at the acclaimed London hotel, The Ned. Across the street from the Bank of England, the stylish Ned was once the headquarters of the Midland Bank. What remains of the bank’s past are 92 pillars of intricate glossy, green verdite marble tiling. The building, designed in 1924 by Sir Edwyn Lutyens is now a luxury hotel that has everyone talking. Located a short walk from St. Paul's Cathedral, the Ned boasts stylish, nostalgia-inspired classic rooms with 1920s Edwardian decor. It’s grand and excessive, encouraging guests to wander and explore the 9 different restaurants, cafes and bars, barbershop, make-up parlor, and an underground spa with a hammam, gym, boxing ring and a pool in the old bank vaults. Rates start at £150 for and span a range of styles and price points up to the £3,500 a night Chairman's suite. When we arrived, the first thing on our minds was a meal at The Ned’s Asian-Pacific restaurant Kaia. We asked several staff members about getting a reservation, but in the end, the restaurant was closed for a holiday and we were unsure when it would open again. We checked Google which indicated the restaurant was open, so we went to the concierge to learn more. The concierge advised that Google was mistaken and could not be relied-upon for information about the hotel. The style of her communication was almost confrontational and made me feel uncomfortable. I am an unabashed Googler. Like many people today, I use Google to check the schedules of restaurants and shops. Really, I use Google to check just about everything I need to know. It seems strange that such a big, modern hotel is out of touch with the importance of Google today. Since Kaia was closed, we opted to try Millie’s Lounge, the Ned’s British restaurant & bar with a promise to deliver “classic British dishes.” The place was packed solid and we were lucky to get a table. Our server arrived quickly and proved to be the highlight of our dining experience. She was friendly and helpful, an example for all staff at The Ned. We ordered some burgers and steaks and had a delightful conversation with the maître Francesco from The Amalfi Coast. While speaking with Francesco, one of his staff brought the drinks. From the corner of my eye, I could see her rolling her eyes, evidently frustrated that she couldn’t deliver the drinks to our table that very second, due to our conversation. We were all shocked by her behaviour. There should be zero tolerance for this kind of negative personality and attitude at a hotel with such standards like The Ned. The next day, we walked and walked around London. With nice weather, you can walk forever in London…and we did. We met up with some friends and enjoyed some bratwurst and beer, which were excellent. We continued our walking and when we were nearly exhausted, we stopped at two burger joints to see which one had the best burger. The competition was fierce between Shake Shack or Five Guys. In the end, it was impossible to decide. Both places serve incredible burgers. I think we already knew this, but we just wanted an excuse to eat more! After a full day of walking, we deserved it! A perfect end to an amazing day. The next day, we decided to try out Cecconi’s, the in-house restaurant in Soho House. When we arrived, we were promptly reminded that we could have the table for a maximum of two hours. Normally, this would be sufficient time to enjoy our meal, but when it takes fifteen minutes for the service staff to bring the menus and take the drink order, it was unlikely that we would be able to eat at a leisurely pace and still stay under our two-hour minimum. Feeling rushed while dining at a nice restaurant takes the enjoyment out of a much-anticipated experience. They should reconsider this policy or improve the speed of their wait staff. Our waiter arrived looking as though he hadn’t any sleep for days or that he was arriving at his shift after coming straight from a party. He was unfriendly and inattentive on top of being slow. Things were not looking good for our experience at Cecconi’s. Hoping to eat quickly, we decided to order some pizza, salads and some fritti, along with some pasta with black truffle (£24). Curious about where the restaurant procured such affordable truffles, we asked our waiter about the provenance of the truffles. In between talking and laughing with 2 other waiters during our meal, he eventually advised us that the truffles were sourced a bit north of Umbria on the way to Tuscany. It seemed unreasonable that they could find truffles in December and sell them for such a low price, it left me with many doubts. In any event, we were disappointed all around with the experience and the meal. This was the worst Cecconi's we ever dined at. We love Cecconi’s and are huge fans of this brand. But this experience left us truly disappointed. Convinced that there must be at least one good restaurant at The Ned, we decided to try Malibu Kitchen, with an American menu that claims to offer “clean eating.” I’m happy to say that Malibu Kitchen was a huge hit with our group. The service was superb, and it was among one of the best California-style restaurants we have ever sampled, at least in London. The Ned is a beautiful property, luxurious and incredibly appointed for the most discerning tastes. But sadly, the hotel and the restaurants are poorly managed with very inconsistent service. In one part of the hotel you may receive service from a friendly, enthusiastic staff member. Minutes later, in another part of the hotel, your waiter may not even look at you. Needless-to-say, this level of inconsistency is confusing and irritating, especially when you consider the high price to stay at such a respected hotel. The next day, we felt inspired to try something out of the ordinary. We went to Ikoyi, a stellar West African restaurant at St James Market (www.ikoyilondon.com). Known for their Jollof cuisine (a mix of West African culinary traditions), this restaurant delivered one of the best meals of recent memory. The wine list is not worth mentioning but the local African beer, which melds perfectly with the flavors on the menu is a “must try” for every visitor. Ikoyi was busy for Friday lunch so I can only imagine that dinner is packed to the rafters. Reservations are highly recommended. As the evening sun dipped beneath the horizon, we ventured to well-known celebrity hang out Casa Cruz in Holland Park (www.casacruz.london). Upon stepping inside, the walls are cloaked in floor-to-ceiling copper, burnished to a soft glow. An oval cocktail bar fronts a mixologist…because cocktails are a thing here. Not surprisingly for the South American vibe, the mounted head of a huge, impressively- antlered deer gazes out from the wall. Climb a mirrored staircase on rich plush blue carpet and find more copper glowing in the warmest way. The roof terrace is an inviting escape with its brown wood seating, which is sadly uncomfortable without cushions. Casa Cruz is an elegant, coppery, cozy restaurant spread over 2 floors in a classic mansion, showcasing a stunning summer roof terrace. As for the menu, try the blackened chicken with Cajun peppers and paprika, and the charred broccoli, chili and almonds. The cod is another good dish, served charred on one side, with chopped smoked cauliflower and parmesan. It combines the best of smoky, charred, salty and spicy in one dish. The only drawback to Casa Cruz is that the flavors are so strong that they overwhelm the palette and mask the natural flavors of the ingredients. The staff was quite friendly, but the menu and wine list were clearly overpriced. Notwithstanding the high prices, the place was filled with Eastern European clientele enjoying a romantic evening. If you like to see celebrities or have a special night to celebrate, this place will do. Ask for a table near the fireplace upstairs or on the terrace during the summer months. At the end of a busy week, we were all looking forward to Saturday. Saturday is game day. Looking to enjoy a pre-match lunch, we went to my favorite pub, the Princess Victoria, which recently reopened. (www.princessvictoria.co.uk) Located near Loftus Road and the perfect spot for lunch before a QPR game, Princess Victoria is the ideal spot to relax and enjoy the local atmosphere before any game. One of the original gin palaces built in 1829, the elegant Princess Victoria has recently undergone an extensive refurbishment to become a truly beautiful public house. The unique horseshoe bar gave us a choice of more than 100 artisan and popular brand name gins, 40 craft beers and an exceptional wine list. The food is always good here. They use local ingredients from across the UK including free range chicken and pork and fish sourced from English day boats off the south coast. It’s always fun and comfortable with food and service that consistently meets expectations. After the game, we ventured out to try XU, the Taiwanese sister restaurant of Bao which opened Autumn 2016. (www.xulondon.com). This group knows what they are doing. The food is remarkable in almost every way. The menu is distinctive: Taiwanese, but with Cantonese accents. We started with xiao tsai (bar snacks) and fell in love with the beef tendon with minced coriander and garlic. From mian shi (wheat-based small dishes), we tasted several dishes, but our group raved about the hollowed-out marrowbone filled with aged short rib, wrapped in Peking-duck-style pancakes. The best is the xian bing. These small fried pancakes filled with minced pork let loose an aromatic broth with ginger, sesame oil and chives. To try them is to dream about them for weeks after. Sunday, we met up for lunch at my favorite French restaurant in the world, La Petit Maison (www.lpmlondon.co.uk). Every time I travel, I try to visit new restaurants. But this trip with my family, I wanted them to experience my favorites. La Petit Maison is at the top of this list. Before you sit down, even before you order drinks, you need to order the whole “Blackleg chicken with foie gras” and have them put it in the oven immediately. Why? This whole chicken takes a full hour to roast properly, and no one wants to wait longer than necessary. The Blackleg foie gras chicken at La Petite Maison is priced at £35 which is a great value because it feeds at least two people. The best part of this dish is the generous piece of soft and warm roasted foie gras. It is always the highlight of the meal. Other notable main courses include the veal chop, an impressive rib-eye and turbot with a delightful artichoke sauce with white wine and olive oil. The creme brulee was perfect and big enough for two. The wine list is thorough, making it easy to find at least a few bottles to complement the remarkable flavors of La Petit Maison. We had an amazing meal and I am happy to say that La Petit Maison retains its spot at the top of my favorites. For Sunday dinner we went to Duck & Rice, Alan Yau’s (founder of Hakkasan) pub in Soho (www.theduckandrice.com). I have visited before and liked it. Sadly, on this visit, the service was poor and some of our dishes did not meet our expectations. This doesn’t happen often, so we left early disappointed. I’ll give it a try again on a future date before crossing it off my “London favorites” list. Monday, before travelling back home, we went to my second favorite restaurant in London. Zuma (www.zumarestaurant.com) has the best izakaya-style Japanese cuisine I have ever tasted. With locations in many cities around the world, the London location was the first one, and has always held a very special place in my heart. As we arrived at our table, a cold glass of champagne appeared magically. The service here is extraordinary in that the waiters are always around when you need them but rarely seen. Within minutes of ordering, the opening act of crispy squid and sliced yellowtail arrived. The yellowtail was remarkable, delicately paired with green-chili relish, ponzu and pickled garlic. A plate of soft-shelled crab arrived next with a wasabi mayonnaise that we devoured quickly. A traditional sushi and sashimi platter came shortly after, preparing the way for the main courses of spicy beef tenderloin, infused with sesame, red chili and sweet soy, and a hauntingly deliciously flaky marinated black cod, wrapped in a Hoba leaf. We loved every bite. But honestly, try anything on this menu. You can’t go wrong. The next day, we decided to have our last meal at the airport. Yes, the airport. Plane Food by Gordon Ramsay, is the best airport restaurant in Europe without a doubt. Located in Terminal 5 of London’s Heathrow airport, the menu, based on Ramsay's Boxwood Café at The Berkeley in Knightsbridge is a refreshing novelty for travellers. Since it was our last meal in London, we decided on a starter of Sevruga caviar (£45) with crème fraîche and blinis. We were speechless in our caviar bliss. Next, we sampled the wild sea bass (£18) which was perfect except for the vegetables inside. The braised lamb was perhaps the best food we have ever had in an airport…anywhere. Simply sublime. Whether enjoying a full meal, or a casual drink before take-off, Plane Food is anything but plain. The only downside is the slightly cramped space. Ramsay should take a note from the leading airlines and provide more legroom for diners by removing even just a few of the 180 seats. Speaking of more legroom…we boarded the plane, sat down to a nice glass of champagne and toasted our incredible week in London. It was a great week with great company. No matter where you roam, it’s always a joy when you travel with the ones you love.